Little-Ark Basic with burrs only. This beautifully designed hand grinder is identical to the white powdercoated unit except it comes in a non-powdercoated polished aluminum version only. Polished aluminum means it's processed in a high speed vibratory machine. This expensive process polishes the aluminum to a very flat finish similar to that of stainless steel feel and appearence. Unlike our competition that offers a generic aluminum finish that's not polished with high pressure water process. Suggested retail price $198.95 To customize your needs, we also stock (4) four different types of grinding attachments for different types of grains and seeds (almonds, masa, tirtilas, beans etc). If you can specify the type of material you want to grind before you purchase your mill we will make sure to send the correct attachment with your mill. Please do not hesitate to call or e-mail us if you have any questions or have a specific application in mind. This is the economical RETSEL version of a hand grinder with a lifetime warranty and a very competitive wholesale price as well. It can be easily retrofitted with stones, burrs and/or a flywheel or any other parts for the models of hand mills we manufacture. The 12 inch computer balanced cast iron fly wheel is optional at additional cost of $69.95. If ordered with a flywheel at the same time, the manual handle is not included. Shipped standard with stainless steel grinding attachment. 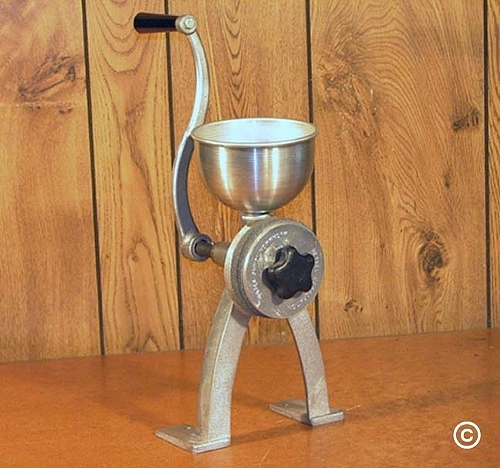 Free shipping on this mill if you pay by check or money order. Some applicable shipping charges may apply when combined with other items. We currently have several pallets of these emergency mills in stock in our warehouse and are ready to be shipped in moment's notice in case of national disasters, market demands, promotional offers, etc. Free shipping on this item if paid with a check or money order or 8% dicount may be applied if paid with check or money order. All our products are made in USA. Due to our strict quality control standards and supplier manufacturing deadlines our delivery time may vary depending on which color and item you select. The standard delivery time on all our products, repairs and special order items is 2 to 8 weeks at this time. Please call us at 208-254-3737 during our regular business hours before placing your order to find our current delivery schedule is at this time.